I haven’t had a lot of time to update this blog recently. It’s served me well over a number of years, but the simple truth is that I haven’t been able to give it the attention it deserves. I’m hoping, in the future, I’ll be able to change that, but for now it’s on hiatus. Having said that, I’m still active in many places online. You can follow the links at the top of the sidebar to find me on various social media outlets, including Instagram and Youtube, where I can most often be found. The latter, in particular, replicates some of what I once blogged about, with videos chatting about my latest reads and writing progress. I hope you’ll join me there! ‘A Lonely War’ is Here! We’re halfway through the summer here in the UK, even if it hasn’t felt much like summer at all. Maybe it’s a little bit more seasonal where you are, and you’re looking for something to read? Well then, this is the perfect post for you! 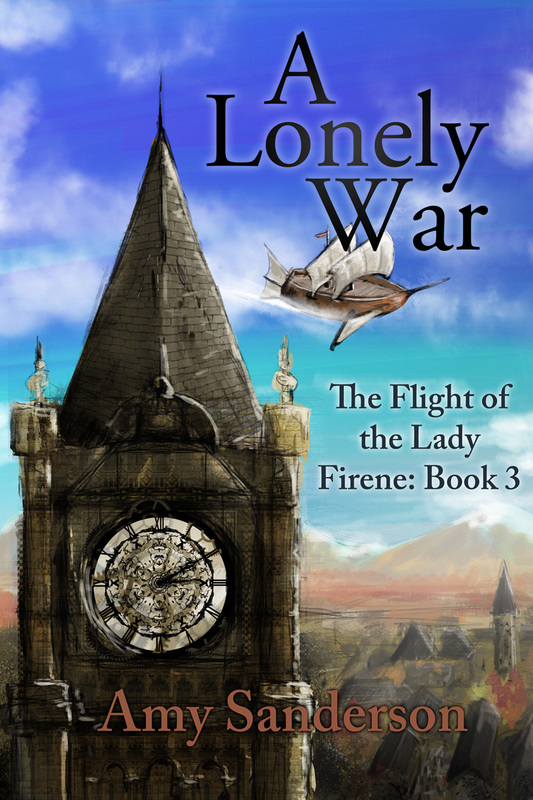 The third book in my steampunk/epic fantasy Flight of the Lady Firene series is now available! It’s called ‘A Lonely War’, and you can find the details below. Home should be where the heart is, but for Fleet Manteios it’s nothing but a place of obligations and bad memories. When she’s drawn back to Requies to attempt a reconciliation with her dying father, she finds it a changed city. Her estranged husband might still be there, but there’s a fresh sense of hope and freedom on the streets – and there’s trouble, too. The last person Fleet expected to see has made her way to the city, and what’s followed her could put every life in danger. 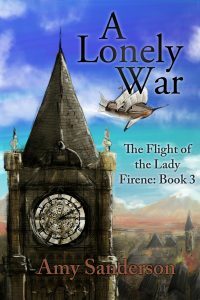 Fleet’s loyalties are about to be divided, between the family she abandoned, the friend who was once a foe, and the city she fled from – and which might not want to be saved. I’m really proud of this book, both the themes that ended up running through it, and the choices Fleet makes during the story. It’s also the longest Lady Firene book to date, which wasn’t intentional, but sometimes you’ve just got to let the story go where it will. I feel like a lot of the recent posts I’ve written, or haven’t yet written but plan to write, have a common theme: namely, that it’s important to know the rules of writing fiction, but also when to break them. Or, in some cases, to break them… but only temporarily. Take this particular piece of advice: every scene in your story should have a purpose. As a reader, I can’t dispute this. Reading a meandering book, filled with descriptions or exposition that seem to do nothing but show you how skilled the writer thinks they are, is deeply frustrating. On the writing side, I think we should strive for purpose and meaning in every scene of a finished story, to improve pacing and tension, and to stop the reader getting bored. But no published story starts out as a fully formed, completed animal, and that’s where breaking the rules come in. You see, I think there’s something to be said for not always knowing your scene’s purpose before you write it. Admittedly, not knowing for an entire novel would make writing it a very slow affair, but sometimes it can be a relief to throw caution to the winds and just write, to see where the characters take you. Not only might you surprise yourself with the twists the story takes, but there can be some truly serendipitous moments, throwing up new possibilities you’d never considered before. If you consider yourself a pantser, i.e. you write by the seat of your pants, this is probably a feeling you get every day. I believe even staunch outliners can benefit from occasionally writing without purpose, though. It often feels to me as though some subconscious part of my brain keeps working on my stories when I’m not actively thinking about them (call it the Muse, if you will, although I don’t believe that’s something writers should rely on or even need to be able to write). When you write without any clear idea of where a scene is going, your subconscious starts throwing in the things it’s been mulling over – and quite frequently it has better ideas! As I said before, I don’t like the idea of relying on the Muse, or writing every scene without a purpose in mind (and I think a lot of pantsers do more internal outlining than they realise), but there are times when you really don’t know what you’re going to write – and that’s okay. Simply putting your characters together and seeing what comes out might surprise you, and might even turn your whole story upside down, in the best way possible. I love Pinterest. Perhaps it’s because I have a very visual brain, but I find endless inspiration in all the pretty pictures and beautiful artwork, sparking story ideas left, right and centre. In recent weeks, I’ve also found it to be a surprisingly useful repository of writing advice, sometimes in poster form, and sometimes in full articles hidden behind the pictures. There’s a problem with taking writing advice from the internet, though, particularly from a site that’s as open and lacking in curation as Pinterest. What one user finds enlightening is going to be completely useless for another… And that’s where this post comes in. You see, whilst browsing Pinterest images today, I came across one titled ‘How to Write a Novel’. I clicked on it, wondering what fresh nugget of inspiration I might find – only to be left dismayed. According to this image, after all, ‘writing a novel’ could be easily summarised in a few bullet points, cheerily arranged on a brightly coloured poster; not only was it painfully simplistic, but some of it was just plain wrong. Okay, if I’m honest, the real problem with this poster wasn’t the advice itself, or its terrible English (always encouraging, given the subject). The problem, really, is with the prescriptive nature of advice like this. Not only is it impossible to break the process of writing a novel into such simple steps (write several drafts, then proofread when you’re done is the last one – so casual, as if that might not take you anywhere from a month to a decade), but it’s also impossible to so clearly define that process in a single way. Every writer works differently, and by that I mean really, REALLY differently, sometimes even from one book to the next. A few bullet points on a poster isn’t going to change that. But this advice is aimed at new writers, you might say. In actual fact, I think that’s worse. Implying there’s One True Way to write a novel is singularly unhelpful for anyone coming to writing for the first time. There are enough worries and insecurities in being a new writer without being told you’re Doing It Wrong. And I know this might sound hypocritical of me, being someone who frequently gives out writing advice on the internet, but here’s the one thing I always come back to: everything I suggest is subjective, and it won’t work for everyone. This is simply my experience, learned by trial and error, by making endless mistakes, and by listening to – but not always heeding – the words of people who’ve been doing this longer than I have. If you are a new writer, worrying about how to tackle your first book, here’s my biggest piece of advice. In the words of a well-known sports brand, Just Do It. Start writing, make mistakes, and learn from them. Every piece of advice you’re ever given (including this one)? Consider whether it could work for you, but don’t treat it as gospel. Every writer needs to find their own path, be that the same as their idol’s or radically different to everything that’s come before. There’s no easy road map to becoming a writer, even to writing a single story, no matter what posters on Pinterest might try to tell you – and whilst that sounds kinda scary, it’s ultimately liberating. Go out there, do your own thing, and remember: there’s no-one who knows your writing process better than you. I am, for those who don’t know, self-employed. With my partner, I run a B&B and smallholding, taking care of the house, the guests and the animals in equal measure. It’s an enjoyable job, but like all self-employment, it comes with a few negatives. Today, for example, I realised that I really haven’t had a day off in at least a week, and won’t get one for several more days. I imagine that the idea of a fortnight without a day off from their job would horrify an awful lot of people, but it’s something that I’ve not only got used to, but actually don’t mind. Quite a few of those days, after all, aren’t a straight eight hours of work; I might work until lunchtime, or 3pm, or simply do a few chores on a day that would otherwise be free time, simply so I don’t have to do them later. It turns out, you see, that I actually quite like having a job that allows me to take this ‘little and often’ approach, and it’s the very same thing I do with my writing. There are two main schools of thought when it comes to getting your writing done, and I’ve seen both part-time and full-time writers who fall on either side. Some are what you might call ‘binge writers’, who save up all their writing time and then hammer out 10,000 words in a day, only to not write again for two weeks. Depending on your work/life schedule, this might work well, allowing you to properly focus on your story for a defined period of time, and thus get far more work completed than you might otherwise have managed in those two weeks. Some people simply enjoy writing this way, whether it makes them more productive or not. For many writers, though, and particularly part-timers with a reasonably regular schedule, I don’t think this is the way to go – and thus we come to back ‘little and often’. The most successful writers, it seems to me, make their writing a habit. There’s no waiting for inspiration to strike, no writing ‘when they’ve got time’ (because most make time, one way or another – more on that in a later post). Instead, these are the people who sit down each and every day, and get the work done. This is a method I’ve gradually settled into over my years of writing, and it’s one I suggest most writers try to adopt, to a greater or lesser extent. Creating that habit, that discipline, tends to get work finished far better than the occasional, irregular binge. It’s no exaggeration to say that slow and steady wins the race – just 500 words written every day will produce 182,500 over the course of a year, which is somewhere in the region of two average-length novels, or an awful lot of short stories. That ‘little and often’ method can also work on a daily basis. Instead of wondering when you’re going to find time to sit down and write 1000 words, aim for just 100, or 10 minutes, or whatever you can fit in. Maybe you’ll only manage 100 words/10 minutes that day – or maybe inspiration will strike, and you’ll suddenly produce a lot more. Maybe you’ll find you can actually fit an extra 10 minutes in here, and another 10 there, and suddenly you’re not so far off that 1000 words after all. This, in my experience, is how stories get written – and, more importantly, finished. Little snippets of time, a few words here and there, and one day you look up to find you’ve produced a book. Not only that, but if you’re a part-timer, you’ve hopefully also found time to have a job, or raise a family, or pursue other hobbies and interests along the way. You find that you don’t have to let writing consume your life if you don’t want to, but that you can still produce stories more quickly and systematically than you’d ever believed possible. I know, for some people, this is all going to feel a bit dry and boring. What about inspiration? What about the Muse? Well, I was a bit scathing about the Muse in my last post, so I won’t repeat that here; maybe you really do need that lightning strike to help you write, and that’s fine. On the other hand, maybe you’re looking at the chaos of your life and wondering how you’re ever going to find time to produce the story that’s burning inside your head. If that’s the case, there really is nothing for it but the ‘little and often’ approach: a few stolen minutes here and there, a few sentences written whilst you’re on the bus, or on your lunchbreak – or even on the toilet, if you really feel so inclined – just to see what you’re able to create. Try it, and see what happens. In recent months, I’ve become fascinated by the world of Booktube and Bookstagram, which are – for those who find the terms as baffling as I once would have done – essentially just posts about books and reading on YouTube and Instagram. There’s something strangely hypnotic about watching someone stand in front of a camera and just review a book, or show you the paperbooks they’ve recently bought, one by one. There’s also something calming about scrolling through pictures of books (or at least there is for me, and I’m fairly certain I’m not the only one), and of course it can be a great way to find recommendations. What I love most of all, though, is how enthusiastic all these video-makers and photographers are about books – just good old, no nonsense books – and reading, and sharing their finds. That passion is incredibly satisfying to come across when you’re a reader yourself, living in a world that so often puts more money, time and effort into every other entertainment and educational medium imaginable. This, then, brings us to the Readathon. A readathon is, at its most basic, an organised online event, during which the participants read as many books as possible, or perhaps try to do nothing but read (particularly when the event is over a short period, like 24 hours). This last weekend saw one of the year’s two Dewey’s 24 Hour Readathons, which is a particularly popular event, and seemed to me as good a place to start as any. It’s an interesting experience, spending 24 hours reading as much as possible, made even more interesting by the fact you’re doing it at the same time as hundreds, even thousands, of other people. There’s lots of chat about the event on social media, lots of people sharing what they’re reading, and a general sense of camaraderie similar to what I’ve found with NaNoWriMo – essentially, we’re all doing this slightly ridiculous thing, because we all share the same love! That connection is a powerful thing, and when everyone is engaged in something as simple as reading, all other boundaries cease to matter. As a means to simply read more books, I also found it quite successful. I wasn’t particularly strict with my time, spending an hour here or there doing something else, and stopping to eat/sleep (which not everyone does!). This particular readathon also fell over two days for a UK time zone, and I was much more successful at reading during the afternoon and evening of the first day than I was the morning of the second. Even so, I read something like 220 pages of a couple of paperbacks (finishing one and starting another), plus about a third each of two ebooks. That isn’t much, perhaps, by the standards of a fast reader, but I’ve gone whole weeks in the past without turning so many pages. Would I, then, recommend readathons to other readers out there? If you either want an excuse to really focus on reading for a set period, or to meet other readers, it’s a definite ‘yes’. I realise the 24 hour structure of this particular event won’t work for everyone (I just got lucky that it didn’t coincide with work hours), but there are a whole range of other readathons discussed online. Some last a day, others a week, but all share the purpose of getting people to read more books, and bringing passionate readers together – and with aims like that, you’ll hear very little complaint from me! This Writing Life: Should You Stick to One Series at Once? I’ve titled this post with a question, and before I begin, I’m going to be completely honest: I’m not sure it’s a question I can answer. This, you see, is a topic I’m currently wrestling with, and all I can do is summarise my train of thought, with the pros and cons that have occurred to me. And really, there are both, whether you choose to write a single series from start to finish, or jump about between books. A little background: I currently have one unfinished series, with two books published, a prequel available to my newsletter subscribers, and another novel on the way. It’s a series that’s very dear to my heart, and I intend to write at least a couple more books (and I have tentative ideas for more after that). The problem is, I’m something of a magpie brain when it comes to writing — whilst I’m usually able to get to the end of a first draft without being distracted, as soon as that’s done, I want to be off and working on the new shiny thing, which isn’t usually the next book in the series, at least not right away. What’s the problem with that? From a writing perspective, there isn’t one. You might struggle to get back into a story’s world when you return to it, having written something else in between, but the same can be said of taking time off to edit, or having a writing break for another reason. I tend to find instead that jumping around between projects give me a fresh sense of enthusiasm when I return to one, as I’ve had time to develop exciting new ideas and view previous books in a more balanced light. No, the cons, in this case, come from the publishing side. Conventional wisdom, you see, suggests that it’s easiest to gain an audience (whether you’re self- or traditionally published) by a) writing a series, and b) producing the books in that series at regular intervals. There are plenty of exceptions to that rule, of course — George R.R. Martin, I’m looking at you — but it’s wisdom that holds true for the majority of writers. That means taking the time to write other books is suddenly off the agenda, particularly if you’re a slow writer, because it’s more important to continue the series you’re already in the middle of. Well, okay, it turns out I do have something of an answer, and it goes like this: do the work. For me, writing first drafts is easy. Editing is harder, and committing to a single series is harder still. Wherever you are in your writing career, though, sitting down and working every day (or at least on a regular schedule) is the most important thing. For new writers, that might mean hammering away until they finish their first book. For me, doing the work means making sure I keep up with at least one series — and if there’s time to write something else, that’s fine, but what I’ve started has to come first. Sometimes, that just isn’t what you want to hear. It’s quite frequently not what I want to hear, which is exactly why I wrote this post. We all have to remind ourselves, from time to time, that commitments have to come before distractions; that whilst writing what you love is important, there’s a reason you started that series, or book, or short story in the first place, and that’s probably got more to do with love than the idea you only came up with two days ago. Whether we have waiting readers or not, we have to stay true to our own vision of what we’re creating — and if that’s a series, then we owe it to ourselves, as much as anyone, to do the work and finish what we’ve started. It’s not something I’ve talked about much on this blog, but I’m a massive fan of writing-related podcasts and have been for a few years now. I’ve also, in the past, thought about starting a podcast of my own, but could never quite summon the nerve. Just sitting alone, talking into a microphone, is somehow a lot more intense than chatting to a group of friends, so I always tended to confine my personal writing thoughts to this blog. Well, no longer! After being brought together by the Guild Wars 2 fan-site Chronicles of Tyria, a group of us intrepid writers have dived into the podcast pool. Every two weeks, we’ll be chatting about writing topics — fan-fiction and character creation have been our first two episodes — as well as including the occasional review/story chat of a game, book or film. Essentially then, if you want to hear me talk about writing in far more detail than I usually do on this blog, or you just like podcasts in general, you should head on over to Words Are Hard, and listen to our first episodes. You’ll also be able to find us on iTunes soon. There’s a saying in the online world that, if you’ve spent much time around marketing blogs, you’ll probably have heard: content is king. It’s usually attributed to Bill Gates, some time in the mid-90s, but for the purposes of this post, its origin is irrelevant. Instead, I want to talk about the idea of ‘content’, and why I think it’s a pernicious one, particularly if you’re interested in a creative lifestyle rather than simply making money online. The phrase ‘content is king’ is most frequently used in blogging terms i.e. you need plenty of quality content on your blog if you want it to succeed financially. That, in its most basic sense, I wouldn’t disagree with. However, in recent years, I’ve seen the word ‘content’ bandied around in a number of other spheres. Content is no longer just what you put on your blog: it’s your fiction, your music, your podcasts, your artwork, your photos of your cat. Again, at its most basic, all of this is ‘content’ – but lumping it all together creates a problem. You see, not all media is created equal, or at least I don’t believe it should be. That novel you’ve spent a year slaving over isn’t equivalent to someone’s newest Tumblr post; a portrait done in oil paints by a skilled artist isn’t equal to that Vine you just filmed of your cat knocking things over. These are exaggerations, of course, and things become more difficult to compare, let alone place a value on, as they either become more similar or when they’re in completely different media (how do you decide whether a masterful painting or a classic novel has more value, for example? The answer is always going to be subjective). This isn’t about deciding which is ‘better’, though, but rather about believing not everything is the same. And that’s where my problem with content comes in. As creators, we’re constantly hearing this ‘content is king’ message, and being told that we’ll only be more successful if we keep producing more, more, more. Trying to follow this mantra, though, doesn’t take into account either the personal value we place on our art, nor the time that’s gone into it; the world would be a far poorer place if every piece of art, music and literature was suddenly replaced by low-grade ‘get rich quick’ blog-posts and tweets, in a misguided attempt to produce more ‘content’. Maybe this sounds a bit snobby, but I don’t mean it to be – there’s undeniably a place in the world for business blogs and cat videos, after all. I’m also well aware that some of the media I consider an important part of my life would be considered trash by others, and vice versa. The important thing, really, is that whatever medium we create in, we take the time to think about what we place value on and why, and to make sure that the rush for ‘content’ never overwhelms our desire to make art, in whatever form that takes. More is not necessarily better, quantity shouldn’t rule over quality, and sometimes you just have to focus on the passion that’s eating away at your heart, no matter how long that takes, or how much ‘content’ you could have created in the meantime. In my last few posts, I talked about why you might want to be a part-time writer, but today it’s time to get into the meat of really doing it: of committing to being a writer, whilst knowing you have a job to go to, kids to look after, voluntary work or hobbies or social events that need your attention. Because all those things are also important, right? Of course they are. The trouble with a lot of writing guides I’ve read is that they espouse a rather simplistic message. If you want to be a writer, they say, you will WRITE. The harshest of these guides suggest that if you don’t write, then you never wanted to be a writer at all. To a certain extent, this is something I agree with. Going for weeks, months or even years without writing anything, whilst continually talking about writing? That really doesn’t make you a writer. Sorry, but it’s true. However, suggesting you need to write every spare minute of every day if you’re going to make it as a writer isn’t true, either. Being a part-time writer is all about finding balance in your life, and the first thing you need to set are your priorities. Fuzzy or not, though, every part-timer needs to work out their priorities. For me, this is a fairly simple process. There are things, after all, that just must be done. I have to work and thus earn a living. I have to eat and exercise. If you’ve got kids, you’ve got to feed and clothe them, too, or maybe you’ve got relatives to care for, or pets. Either way, these things will take up a certain amount of your time, and whilst you can try to delegate or maximise your efficiency all you want, that’s never going to completely go away. Where priorities really become important, though, is in regard to the remainder of your time. You’re home from work. You’ve eaten. You’ve walked the dog. Now what? It can be all too tempting at this juncture to turn on the TV, or reach for a book, or watch three hours of cat videos on YouTube before you fall into bed. Quite frankly, there are days when I can’t find the energy to do anything else. The rest of the time, though, when these temptations sneak in, I start asking myself questions. Which is more important to me: finishing this book or watching another episode of Location, Location, Location? (My love for home buying/renovation shows knows no bounds.) Am I going to kick myself if I don’t get this chapter finished this week? Are people really going to remember my extreme prowess at Minesweeper after I’m dead? Okay, maybe that sounds a bit drastic, especially that last one (I’m terrible at Minesweeper), but there are times when you really have to remember what your priorities are. Maybe the most important thing to you right now is volunteering at a soup kitchen, or redecorating your living room, or raising alpacas, in which case you need to go out and do those things. Maybe, though, it’s writing that’s more important to you than anything else — which means, when the lure of the TV, book or video game is calling, you have to be strong. You have to write instead. I realise this isn’t always as easy as it sounds. How do you choose between an obligation to a family member or your community, and your personal goals, for example? Explaining your priorities to those around you can also be hard, particularly if your loved ones just don’t see value in your writing. However, having some idea of your own priorities is absolutely valuable for part-timers in all fields, so that when distraction and weariness set in, you can think about what you most want out of life, and immediately know how to spend your time. And if one of those priorities is writing, and you put aside everything else to do it? That’s when you can call yourself a writer.